If you were looking for an Egyptian who could help his country fulfill the lost promise of the Arab Spring – some day – you couldn’t do better than Emad Shahin, an internationally renowned and liberal scholar who studies political Islam. So why was this mild-mannered academic sentenced to death in absentia Saturday in a Cairo court? The answer lays bare the misguided policies of Egypt’s new autocratic government, led by President Abdel Fattah el-Sisi, which is trying to muzzle all domestic critics in the name of fighting terrorism. This strategy is more likely to make Egypt’s terrorism problem worse. 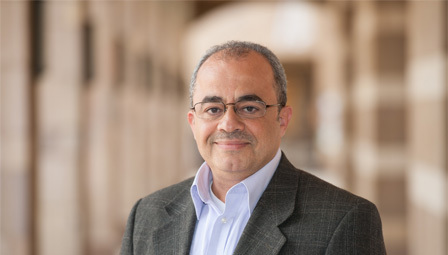 Shahin, a visiting professor at Georgetown University on leave from the American University of Cairo, was condemned along with 16 others on charges of conspiring with Hamas and Hezbollah to destabilize Egypt. The charges are ludicrous, according to the many U.S. academics who know Shahin well (he holds a Ph.D. from Johns Hopkins University School of Advanced International Studies and has taught at Harvard and Notre Dame). “I would sooner believe that Vice President Biden is a member of the Symbionese Liberation Army than I would give credence to the charges against Emad,” says Nathan Brown, a well-known expert on Egypt at George Washington University. I agree. Moreover, Shahin, who “categorically and emphatically” denies the charges, has never been a member or supporter of the Muslim Brotherhood. Why, then, did an Egyptian court sentence him to die? Shahin appears to have been targeted for his criticism of the military’s bloody crackdown following the coup against Brotherhood leader Mohamed Morsi, the country’s first democratically elected leader, when around 1,000 peaceful protesters were killed. While sharply critical of Morsi’s performance, Shahin had also argued that ousting him would strengthen the claim of violent Egyptian Islamists that it is pointless for Islamists to run in elections since the results won’t be respected. The Brotherhood, for all its flaws, had abandoned violent tactics decades ago and opted to work through the political system. “Sisi is validating the militants’ claim that you can only deal with the regime via violence,” Shahin said. The Sisi regime has vowed to destroy the Brotherhood, linking its members with violent jihadi groups in the Sinai, although terrorism experts see no such connection. Morsi was sentenced to death with 100 others in another sham trial on Saturday for the crime of breaking out of jail in the midst of the Tahrir Square revolt against President Hosni Mubarak. Morsi and other Brotherhood members had been rounded up by Mubarak’s security forces but escaped after the guards abandoned their posts. Earlier this year, a judge handed down more than 1,200 death sentences, mostly to Brotherhood members, in two mass verdicts. Egyptian authorities admitted last year to having arrested 22,000 people, mostly Brotherhood members. Egyptian human rights groups claim the number is double that. Meantime, the government has also gone after leaders of the liberal groups, such as the April 6 Movement, that were the organizers of the Tahrir revolt. Bloggers and journalists also languish in prison. “They want to crush any kind of movement that can create an opposition to them,” says Shahin. In one especially troubling case, Egyptian courts sentenced Mohamed Soltan, a 27-year-old Ohio State graduate and dual American-Egyptian citizen, to life in prison after he worked as a volunteer translator for foreign press during a peaceful Brotherhood protest. A hunger strike left him gravely ill, but, amazingly, given $1.3 billion in annual U.S. aid to Egypt, American diplomats haven’t been able to get him deported back to the United States. Shahin believes his own case is meant to send a warning that “it is very risky to oppose the regime,” even via writing or verbal critiques. “They are undoing the revolution and creating a security state under the direct control of the military which can usher in decades of authoritarianism,” he told me. He says state-controlled media are whipping up public fears of instability, which the government blames on its opponents. The tragedy here is that Sisi’s heavy hand is likely to worsen the real terror threat the country faces. In the Sinai desert, where ISIS-linked cells have attacked Egyptian security forces, the government has alienated tribes that might be convinced to repel the jihadis. And by crushing all political dissent, Sisi is repeating Hosni Mubarak’s mistakes and once more fueling the frustrations that led to the Tahrir Square explosions. “He’s shut down every peaceful avenue for civic participation,” says Shahin. “He is pushing the entire country to the brink of violence.” Younger Brotherhood members are already hinting, since Morsi’s death sentence, that violent tactics may be needed. But the death sentences of Morsi and Shahin – at opposite ends of the political spectrum – should serve as a warning to the West that Egypt’s war on dissent is bound to boomerang. President Obama should be making this point forcefully to Sisi.